BDF attorneys Nikolas T. Nikas and Dorinda C. Bordlee create and deliver dynamic lectures and debates at law schools, medical schools, undergraduate colleges, universities and seminaries; and are frequent speakers at professional legal, medical and civic conferences. Nikas and Bordlee are also available internationally, with experience providing legal expertise to parliaments and professional legal and medical conferences in Korea, Republic of Georgia, Rome, and several countries in Central America. 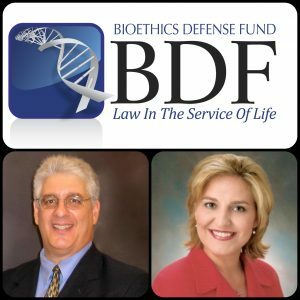 While their experience derives from constitutional litigation and strategic legislative drafting, BDF attorneys Nikolas T. Nikas and Dorinda C. Bordlee are sought after for their ability to effectively communicate the pro-life position on complex issues in a way that is clear and concise, yet comprehensive. We are able to develop custom presentations for professional schools of law and medicine, legislative briefings, continuing legal education (CLE), and continuing medical education (CME). — Can Morality be Legislated? BDF’s law and policy experts are also available to address Catholic civic groups. Our Hannan Institute for Human Rights in Science is a BDF educational project funded by the Catholic Foundation of New Orleans that focuses on the philosophical anthrop0logy that respects the dignity of the human person in light of natural law and the compatibility of faith and reason.